Who doesn't enjoy a bright day,.. When was the last time you had a truly Bright Day? When dark skies turned into colourful rainbows. The sound of raindrops on your umbrella suddenly made the perfect melody? That exact same feeling was the start of A Bright Day. I hope these cute little characters bring the same smile on your face as they do to mine when I create them. 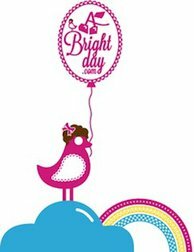 A Bright Day designs a colourful and joyful line of greeting cards, paper ware, back to school and yearound lifestyle products. Once you're introduced to the happy and loving characters, they just magically brighten up your day. Our Mission is to spread smiles and brighten up your day! And since A Bright Day is a nature lover, ♥ all the greeting cards are also available in a 100% recycled paper. We think that that's A Bright thought. Meanwhile wishing you A Bright Day!